You must cancel with the hostel directly at least 48 hours before booking date or you will be charged the 100% of the first night or in case of no-show. A reduction in the group must be made up to three days before arrival. Private rooms will be no longer private unless wish to pay for the full room. Spire Hostel is not responsible for any bodily harm, theft, loss or damage to any personal effects. Guests who have been evicted will not receive a refund. Guests will be expected to reimburse the hostel for any damages caused by inappropriate behaviour. To do so inappropriate usage of any emergency equipment or system is a serious offence and will be subject to fine and termination of residency. Inappropriate behaviour will result in eviction from the premises with no refund. Group security deposit may apply for bookings with 8 people or more. The property may pre-authorize the booking owner's credit card for group security deposit or will hold the security deposit in cash at the check-in - between €100 and €400 - depending on the group size, to be charged in the event of misbehavior or lost keys. Payment: We will accept individual payment if wish to pay by credit card. Payment in cash has to be organised previously to pay together, at check-in we are not able to give change for individual payments on a large group. For security reasons, some common areas are under video surveillance. More than 22 people for a group booking must contact the hostel for availabilities. We can accommodate up to 100 guests total on the premises. FREE breakfast, FREE Wi-Fi, FREE luggage room, FREE events every Saturday, FREE hair dryer, FREE walking tour of Dublin. Small lockers are available for rent at the reception area and towel is also available for rent. Many Tours options and Pub Crawl available for purchase at reception. Best location in Dublin, right on the heart of Dublin. Book with us now! We do have one of the best location in city centre!!!!! 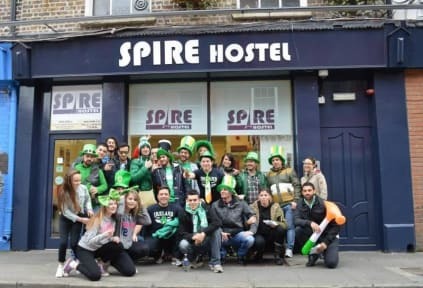 Spire Hostel is the MOST central Hostel in Dublin, just 1 minutes from the Spire!! A perfect choice for young people, backpackers, week-enders and student to stay in Dublin. The hostel is also a perfect choice for groups well accommodated in large rooms En suite. Our staff team speak various languages and are both friendly and helpful to welcome you. We work to give you a funny, relaxing and great time that will be unforgettable!!! The Hostel has 4 floors in the building- total 12 rooms & 120 beds all dorms. Large and lovely BBQ area outside!!! We also have the communal modern kitchen with all appliances where guests can make themselves hearty meals or quick snack. So come and feel in your house!!! We have common areas and free luggage room, so you can wait your check-in time! Check-out is at 11:00am. If you check out late, you will be asked to pay an extra charge, so make sure you’re up and ready in time to leave your room! You can leave your bag in our free luggage room for the day of your check-out. Valid identification IS A REQUIREMENT. WITHOUT VALID IDENTIFICATION such as Passport/Drive Licence or Official Photo ID, guests will be refused to check in. This property has AGE RESTRICTION: Spire Hostel is not suitable for guests under 18 years old. Guests are preferable between 18-45 years old, however everyone is more than welcome to stay with us. Unlike some hostels, we do not have an upper age limit. Most of our guests are backpackers in the 18 to 45 age range. Note that we do not guarantee bottom beds on bunkbeds for anyone; hostel can be noisy by young guests. If cancelled 24 hours before date of arrival by check-in time 2pm, NO fee will be charged. If cancelled later than 24hours or in the event of no-show, 100 percent of the first night will be charged. Note that any part cancellation such as 1 night, 1 person or even entire booking is free of charge if only made 24 hours prior check-in start time 2pm. We accept payment by cash, all major debit & credit cards except for American express. Excelente atendimento. Muito bem situado no centro da cidade. O pequeno almoço é super completo... O pessoal que lá trabalham é incrível. Adorei. Certamente quero voltar lá. Ótimo lugar, excelente localização e serviço impecável. Cheguei no hostel e fui recebida com funcionários me julgando pelas minhas malas dizendo que eu não iria precisar daquilo . Acredito que são minhas e não tenho que ficar dando satisfação. Quando fui fazer o check out as funcionárias estavam na recepcao fingindo demência e nem se quer olhou na minha cara para perguntar se precisava de alguma coisa ajuda ou mesmo só um táxi . Pois sei que não estão ali para carregar nada mais talvez serem mais gentil e educados faz toda diferença. Good location but quite expensive for what it offers. The breakfast is extremely poor and hostel is quite noisy during sleeping hours (past 23h and early in the morning) which makes it impossible to have a good night of sleep. Overall I would not recommend it, at least not for that price.